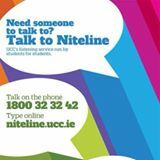 Niteline is a student-run non-profit organisation. We are a completely confidential and non-judgemental service here to provide free emotional support to any student in need. We operate every week during term from Mondays through to Thursday from 9pm to 1am! If you have any worries, no matter how small, don’t hesitate to reach out.